Generally, mandala designs are made of intricate geometric patterns. First developed for spiritual purposes in ancient times as a part of the pre-Hindu traditions in India, mandalas were symbols of the universe to remind the viewer that they are simply a small part of a greater whole. When we work on a mandala today, whether it’s in a coloring book, for a tattoo or personal healing, we may have a plethora of patterns and designs to chose from. Let’s look at a gallery of ancient and modern mandala designs and their meanings and be ready to print our next masterpiece. Looking for a modern design that’s perfect for a tattoo? Try the classic sun mandala, or a circular design woven around a crescent moon. These pieces of art aren’t tied to a specific spiritual tradition, so it’s fine to use them as you please. Many people meditate on nature-based designs to remind themselves of their link to the larger world, just like others do with more traditional designs in other spiritual paths. Some of the most visible and prolific mandala artwork found online and offline comes from the New Age and psychedelic community rather than a genuine spiritual tradition. Nevertheless, the neon colors and chaotic combinations of lines and curves are still great for spicing up your home decor or brightening up your wardrobe. You’ll usually find these designs on wall tapestries, iPhone covers, and other material possessions instead of hanging in a church or temple. Again, the ancient Celts didn’t make mandalas, but they did design intricate knots to carve into wood and sew onto clothing. Many modern artists combine the mandala and Celtic designs, such as knot styles, to create beautiful pieces of art with a interwoven look. Look for Celtic mandala coloring books for a fun way to relax and encourage your creative side. 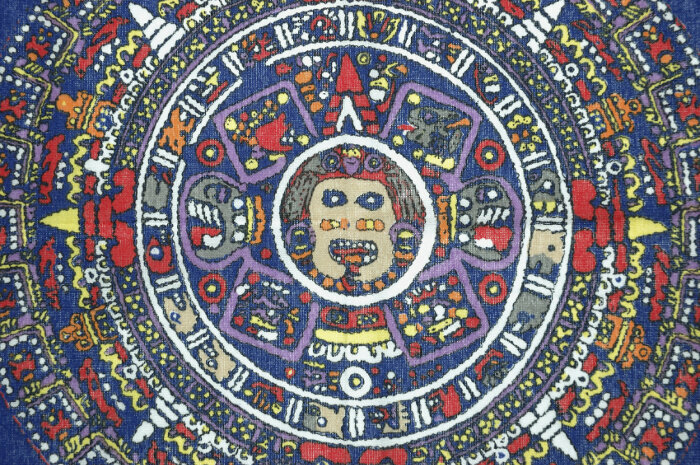 While many Native American tribes created large scale artworks in order to represent their spiritual beliefs, these aren’t technically mandalas. Instead, they’re more accurately referred to as medicine wheels. These are huge outdoor designs based around a circle and representing the entire universe, just like mandalas. Most medicine wheels are made with stones and decorated with natural pigments. Since mandalas were exclusively a part of Asian religions for hundreds of years, naturally Hinduism features some of the most intricate and beautiful designs. While there are thousands of mandalas with unique meanings, perhaps the most well known design outside of India is the Sri Yantra. It’s not technically a mandala, but rather a yantra, which is the name for similar sacred geometry symbols without the iconic circular layout. The Sri Yantra consists of a square surrounding a circle and in the center of the circle there is a lotus. Inside the lotus you’ll find nine interconnected triangles, which form a total of 43 smaller triangles. It symbolizes non-duality and the reconciliation of opposites. See also Hindu Mandalas. Aside from Hinduism, mandalas also play a big role in Tibetan Buddhism as a meditation and teaching tool. Monks spend days carefully pinching and blowing out brightly colored sands to create huge pieces of art. When they’re done, they admire the finished design for a few hours, then erase the work to remind themselves that nothing is permanent and that attachments only cause suffering. 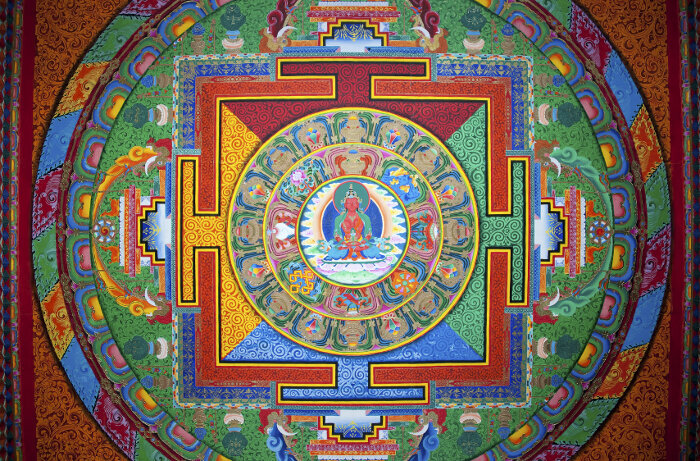 The Kalachakra is the most commonly used sand mandala because it has deep Tantric meanings that initiate everyone who views it into a more spiritual state of being. Finally, you can find other types of mandalas in Japan, China, and most other Asian countries. Even if they only arrived recently in those cultures, they’re still treated as important spiritual tools instead of designs appropriate for using as tattoos and home decorations. Most of these designs are handled less seriously in the West outside of devotees to Eastern spiritual paths, but Christian mandalas are usually well-respected by both the people who design and use them. These designs are usually installed as stained glass windows so church goers can focus on them while sitting in prayer or listening to a sermon. However, some evangelicals consider this type of artwork a violation of traditional Christian beliefs.